The discovery of a Neolithic tomb provides the earliest evidence of human settlement on the rocky outcrop overlooking the Maine, dating back to around 4000 B.C. The site was subsequently occupied by the Gauls, and then the Romans. During the Romanesque era (10th - 12th centuries), a vast count’s palace was built here. The only remains of this building are the walls of the grand hall, the steam room and the small chapel of Saint Laud. Construction work on the fortress began in 1230. It was commissioned by regent Blanche of Castile and her young son, Saint Louis. The ramparts, measuring around half a kilometre in length and featuring 17 shale and limestone towers, clearly indicate the fortress’ intended purpose – to dissuade potential attackers. In the late 16th century, the towers were shortened by around 20 metres and pepperpot towers were added to the roofs, giving the château its current appearance. These changes were made to adapt the building to changes in artillery technology, and in particular the appearance of the cannon. The fortress was intermittently occupied by the Dukes of Anjou in the 14th and 15th centuries. These extremely wealthy princes and close friends of the king of France were prolific builders and art-lovers. Louis I, Duke of Anjou, modernised the count's palace and Louis II built the chapel. However it was René who built the royal dwelling (1435 to 1440) and the ostentatious castellum (1450) that encloses the courtyard. During this period, the gardens featured a number of temporary buildings and an extraordinary menagerie, containing both domestic and exotic animals. Louis I, Duke of Anjou, also commissioned the Apocalypse Tapestry in 1375. Originally measuring 140 metres in length (of which 100 metres currently preserved and on display), this tapestry illustrates the story of the Apocalypse from the Book of Revelation by Saint John (the final book of the Old Testament). It also reflects the anxieties of the late 14th century, amid the context of the Hundred Years’ War. The tapestry was produced during a period of extraordinary cultural impetus, backed by exceptional financial and technical resources. It reflects the talent of Jean Bondol, a well-known artist and the king’s painter. 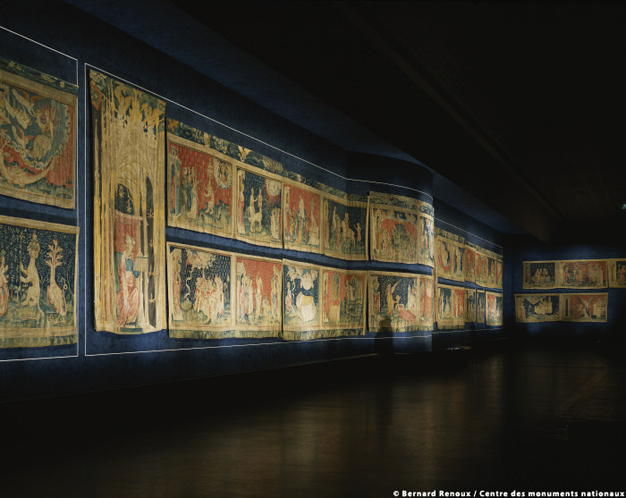 The Apocalypse Tapestry is now on display in a specially created gallery to ensure that it is properly preserved. As well as being a place of luxurious and refined courtly life, the fortress was also a prison for seven centuries. In 1661, Fouquet, arrested by d’Artagnan in Nantes, was imprisoned at the fortress, and it later housed the departmental prison in the first half of the 19th century, holding both criminals and the mentally ill. The fortress was used as barracks until the middle of the 20th century. After the army finally deserted the building in 1947, it was opened to the public and the Apocalypse Tapestry, which René of Anjou had left to Anjou Cathedral, was returned to the fortress. The grounds of the fortress include remarkably large gardens, with a “standard” garden featuring box trees and yews, a vineyard, a vegetable garden, a rose garden, the hydrangea garden at the royal dwelling, the hanging garden with medicinal and tincture plants, as well as a number of species depicted on the Apocalypse Tapestry. 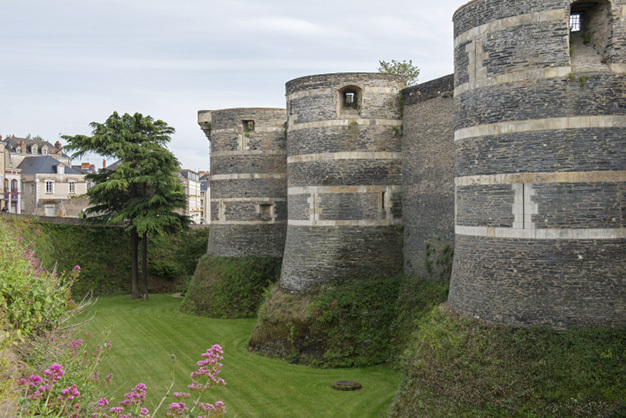 The château of Angers is a site of extraordinary richness and diversity, featuring archaeological remains, a royal fortress, ducal buildings from the late Middle Ages, and the Apocalypse Tapestry – an ancient, vast and highly technical masterpiece of mediaeval art.